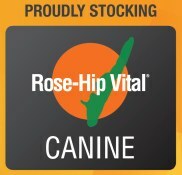 Dog-Gone Walking & Pet Minding proudly stocks Rose-Hip Vital Canine powder, a 100% natural anti-inflammatory and antioxidant which may be beneficial for improving joint health and the general well-being of both active and ageing dogs. It leads your dog from the front to give you steering. Steering means control - like a horse is led from the front. Now available in Australia and from Dog-Gone Walking and Minding. Watch the video and see the better way to walk your dog.